Imagination-with it we can go anywhere. Through books, plays, or movies we travel to strange worlds...worlds of the past...worlds of the future...worlds that were and those that will never be. And what we learn there touches us, changes us-but what if we became a part of it? What if our very belief in what we read affected the outcome of the story-if we became part of a neverending story? 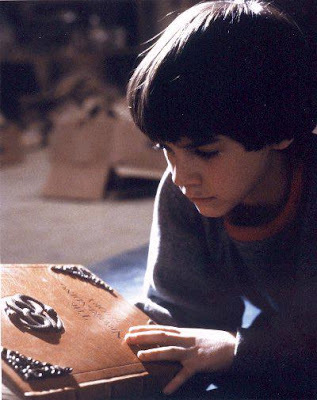 Ten-year old Bastian (Barret Oliver) finds himself facing that very question. 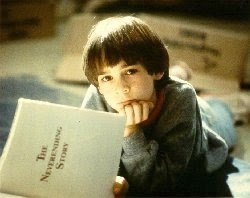 Seeking refuge in a bookstore from school bullies, he finds himself drawn to an old book, The NeverEnding Story. Bastian takes it with him to his attic and settles down for a good read. To his surprise he finds the hero of the story is a boy, not so different from himself. The magical land of Fantasia is being threatened by The Nothing, a void that negates everything in its path. The strange inhabitants of Fantasia are making a pilgrimage to the Ivory Tower, home of the Empress. They hope she can protect them from the oncoming nothingness. But the Empress is affected by the Nothing as well. She has decreed that only the Warrior Atreyu can save the land. A boy steps forward, announcing he is Atreyu. Although surprised, the Empress's spokesman, Cairon (Moses Gunn), does not question his Empress's wisdom and offers Atreyu the Auryn, a gold and silver amulet with two snakes forming an oval. It has the power to protect him as he must not carry weapons. To his surprise Atreyu discovers that Shell Mountain is not where Morla lives but is Morla...a giant swamp turtle. Caught up in the adventure Bastian screams out. To his disbelief, Morla and Atreyu hear his scream coming from the swamps. Somehow he is being pulled into the world of Fantasia. This magical device shows the observer his true self. Atreyu sees Bastian and Bastian reads of Atreyu seeing him. The Southern Oracle tell Atreyu that the boy beyond the borders of Fantasia is the one to save the land from The Nothing. Atreyu and Falkor go seeking the boundaries of Fantasia but cannot find them. Bastian makes his decision and steps into the world of Fantasia...to save an Empress...to fight terrible creatures...to sail the wind on the back of a luckdragon...to protect a world from the Nothing. And as he steops through into Fantasia he brings us one step closer to joining the NeverEnding Story. On the other side of the coin (or mirror) is Barret Oliver who must portray a quiet, intellectual boy capable of being caught up in the excitement of his imagination. Barret has been a busy young actor and so may be familiar to many movie-goers, although his name may not yet be attached to his face. He can be seen on television doing commercials for McDonald's, Goodyear Tires, Visa, Security Pacific Bank, Marineland and Hertz. At the movies he's appeared in Kiss Me Goodbye, Jekyll and Hyde...Together Again and White Dog. A few years ago he appeared with Noah Hathaway on an episode of Battlestar Galactica and was seen on The Incredible Hulk, Knight Rider and Love Sidney.